Male Eastern bluebird on redbud tree: photo © James Ownby: My View of Nature (all rghts reserved; used by permission). The Eastern bluebird is a medium sized songbird (small thrush), with a short tail, chunky body, large round head, short black bill, a reddish-orange chest, and blue wings and tail (the female is a drab gray-blue with duller reddish chest, and juveniles have a spotted chest and back). The bluebird's song is a rich warbling whistle broken into short phrases (Tu-wheet-tudu) or a dry chatter. Eastern bluebirds prefer an open habitat with sparse ground cover (such as orchards, parks, and large lawns). 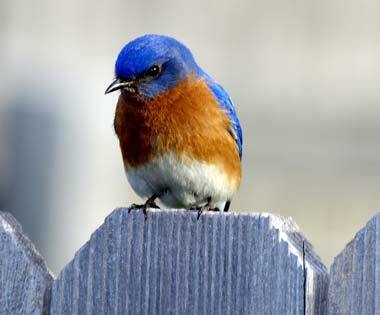 The eastern bluebird's diet consists of insects and small fruits. Eastern bluebird nests are found in tree cavities and snags, and in nest boxes; they usually have more than one successful brood each year. Chicks from early nests usually leave their parents in summer, while the young from later nests frequently stay with their parents all winter. The male Eastern Bluebird performs a "Nest Demonstration Display" to attract the female. He brings nest material to the hole, goes in and out, and perches above it waving his wings. This is his only contribution to nest building (the female eastern bluebird builds the nest and incubates the eggs). The nest is made with woven grasses or pine needles, and lined with fine grass, hair, or feathers. 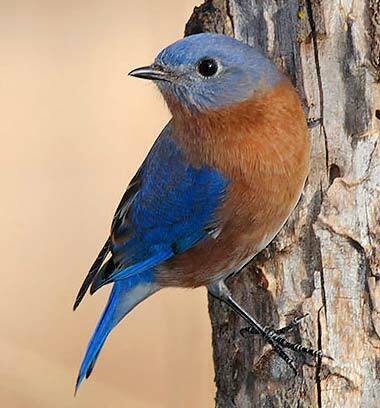 Populations of Eastern bluebirds declined in the 1960s and 1970s, but have since increased (the popularity of nest box campaigns are probably responsible for increases). Male Eastern bluebird; photo by Danny Barron on Flickr (noncommercial use permitted with attribution / no derivative works).